Of all the holidays, Hanukkah and Purim are considered special for many reasons. 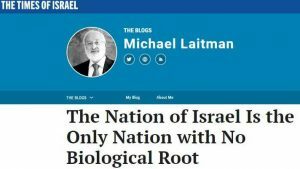 First, the Torah makes no mention of them. Second, after the full completion of humanity’s corrections, it is said that all the holidays will be canceled except for these two. According to the wisdom of Kabbalah, Hanukkah and Purim are of utmost importance because both are directly connected to the rebuilding of the Temple, which symbolizes the place where Creator and creation bond. The Temple’s ruin represents a breaking of this bond between us. Rebuilding that bond means attaining all the abundance and goodness in our existence. This is the Kabbalists’ quest. 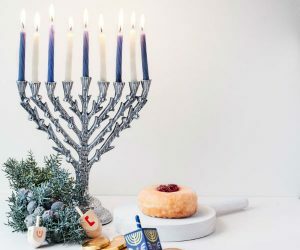 The word Hanukkah, from Hebrew “Hanu-Koh,” or “stop here,” represents the first stage of spiritual development, a process of correcting the desire to enjoy for oneself and inverting it into a desire to bestowal unto others, a state that liberates us from darkness. Darkness manifests as separation, conflicts, arguments, ruthless competitiveness, and the desire to exploit and dominate others. Our inner struggle to overcome our egoistic nature is what we call “The War of the Maccabees against the Greeks,” i.e. “Greeks” symbolizing characteristics that yearn for control over us. Overcoming our ego — the desire to enjoy at others’ expense—requires rising above our nature, and this is considered a miracle. Instinctively, our ego governs our existence, even though the outcome causes a boomerang effect that brings us suffering. How then does this miracle happen? Every time we connect with each other, the force that is higher than all other forces, obstacles and conditions, is drawn into action and the miracles manifest before our eyes. The riots taking place in the heart of Paris are the seeds of an inevitable change in the rules of the socio-economic game in Europe. 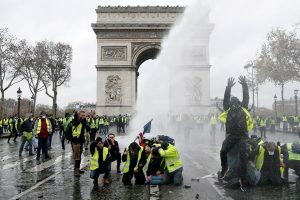 The “yellow vests” people protest the rise in fuel prices and cost of living as they are vandalizing the streets, torching cars and pillaging shops on the Champs-Elysées. Even the statue of Marianne, the national symbol of freedom originating in the French Revolution, was not immune to the wrath of the protesters. These violent acts express a growing sense of deprivation and exploitation that people feel towards their government. Beyond those who take to the streets, many are beginning to sense that the ruling elite is concerned with its own interests, with no regard to the needs of its citizens. They are beginning to realize that their leaders have one mission in mind: to preserve their throne in every possible way. And when modern Europeans feel like they are being dispossessed from the little they have left in their pocket – everything becomes permissible. Their barbaric side comes out and their rage translates to violence, plunder, and chaos on the streets. Even if a person risks being shackled in prison the next moment, the erupting human ego cannot be restrained. Meanwhile, French President Emmanuel Macron was in Buenos Aires at the G20 summit, sitting around the table with other world leaders, as each of them maintains focus of their personal interests. In their case, the ego blinds them from seeing the intricate network of global interdependence that connects them. Every leader is busy tying another knot, ignoring how the reality around them is unraveling. Setting the tone at the summit, Trump secures his country’s interests. He reaches understandings with his Chinese counterpart, to forge an agreement that will benefit both countries. The U.S. president typically demonstrates isolationism, yet with a clear aim to benefit his country. He does that, for example, by blocking the entry of illegal immigrants into America, unlike Europe, which keeps its doors wide open. Europe in its deteriorating state is somewhat reminiscent of the Soviet Union in its pre-disintegration period. Social polarization is intensifying daily, there are many clashes of interests between leaders, and some countries are seeking to withdraw from the European Union – all the while waves of immigration continue to shake the socio-cultural fabric of the continent. However, the powerful blow that will shock Europe will be the dissonance between affluence and poverty. While billions of euros are flowing across the European Union, the middle class is becoming poorer and angrier. At the same time, an unparalleled technological-industrial revolution is fast approaching, threatening hundreds of millions of jobs. When approximately 60% of the public in one of the European countries find themselves out of the workforce and unable to return to it, changing the rules of the game will be inevitable. It is easy to envision a “European spring” scenario where riots – as we just saw in Paris – spread like wildfire across Europe. Even today, a group of statisticians from Poland predict that we have about 12 years until a “global financial crisis of unprecedented scale” takes place. But in a globally integrated system, where every part is intertwined with everything else, such a crisis may certainly occur beforehand. The first, necessary step in changing the rules of the game will be to provide some form of basic income to every person that will cover the basic necessities for life. However, bread alone will not satisfy the human being for long. A guaranteed income will appease the body, but not the spirit. Economics is a reflection of human relations. It’s about what one gives to and receives from society. Therefore, if one will receive what he needs from society, and will no longer be judged by his socioeconomic status, social values will have to change. Many will compete on the formation of new social values. Leaders, religions, radical activists, and various ideologies. But only one social concept will be capable of uniting Europeans and maintaining peace on the streets. It is the concept that will be in balance with the natural course of human development. The concept that will make every person recognize that we are all connected and interdependent. It will raise humans to a higher level of consciousness, introduce them to a deeper level of connection, and infuse their spirit with a new motivation. Ultimately, the quality of connection between people will be the basis for a healthy, new society and economy. Question: When I see my friend as lower than myself, this is my normal egoistic state. Does all my work happen when I feel smaller than my friend? Answer: No, because it is a question of work that it is necessary to come to through internal efforts. There are people who constantly feel below others. There are people who always feel superior. There are those who do not pay attention to others at all, do not even notice them. All the work is to first grasp onto the goal, the Creator, and from this determine our present state. The fact that we are trying to grab hold of the goal together makes us equal.